My daughter looked at me and sighed. She asked if we have any caramel for apples? I thought to myself, not right this minute, but I can have it in 90 minutes! You just need one ingredient~ One can of sweetened condensed milk. There are a couple ways that you can make Dulce de Leche, on the stovetop, microwave, crock pot or oven. My crock pot was full preparing dinner, so I went with the stovetop method. In a large pot, Immerse can in water, make sure that the water is covering the can at all times, very important, you don’t want the can to explode. Boil for 90 minutes. Carefully remove can, I used a waterproof oven mitt and tongs. Let cool, open can, pour into a glass container and stir, store in refrigerator. Serve with cut up apples, coffee, over cakes, brownies, turnovers, there are unlimited ways to use Dulce de Leche. 1. Oven: This is a great way to make it because it gives a smooth creamy texture with minimal work. Empty the contents of a can into an oven-proof dish; sprinkle with some kosher salt and tightly cover it with foil. Place the covered dish in a larger roasting or casserole pan and fill it up with water until it reaches three quarters of the up the covered dish to create a water bath. Bake at 425 degrees F for 60-90 minutes checking every 30 minutes on the water level and adding more as needed. 2. Stovetop: This method takes the longest, but it allows for the most control over the consistency. Remove label from can. Pierce three holes in the formation of a triangle on top of can (this is critical to release the pressure from the heat or else the can may explode.) Place the can in a sauce pan and fill the sauce pan with water three-quarters of the way up the side of the can. Bring water to a simmer and keep it there for 3-4 hours or until desired consistency. For a thicker more syrup-like texture cook closer to 4 hours. When ready, use tongs to remove can allow to cool slightly and pour dulce de leche in a bowl and whisk to smoothness. Let cool before storing. 3. Microwave: The fastest way, but it may yield a less smooth texture than the other two methods. Empty contents of can in a microwave safe dish and loosely cover with plastic wrap. Cook it on medium in two minute increments stirring between each increment (be careful of any steam as you lift the plastic wrap) up to 10 minutes for thinner pouring consistency, or up to 13-15 minutes for a thicker, syrup-like consistency. Let cool before storing. Transfer the contents of the cans of sweetened condensed milk into the canning jars, filling each jar no more than three-quarters of the way. Place the seals on the jars, and loosely affix the bands until they are on well, but not quite finger tight. Air should be able to circulate through the seals so as not to have them explode under the pressure created by the steam in the crock pot. Set the jars into the crock of a slow cooker. Fill the crock with enough cold water to immerse the jars in water until it is one-inch from the top of the jars. Place the lid on the slow cooker and heat on low for five to seven hours, depending on the desired consistency. Five hours for flowing caramel. Carefully remove the jars from the crock, and let stand at room temperature until cool. Caramel will continue to thicken as it stands. 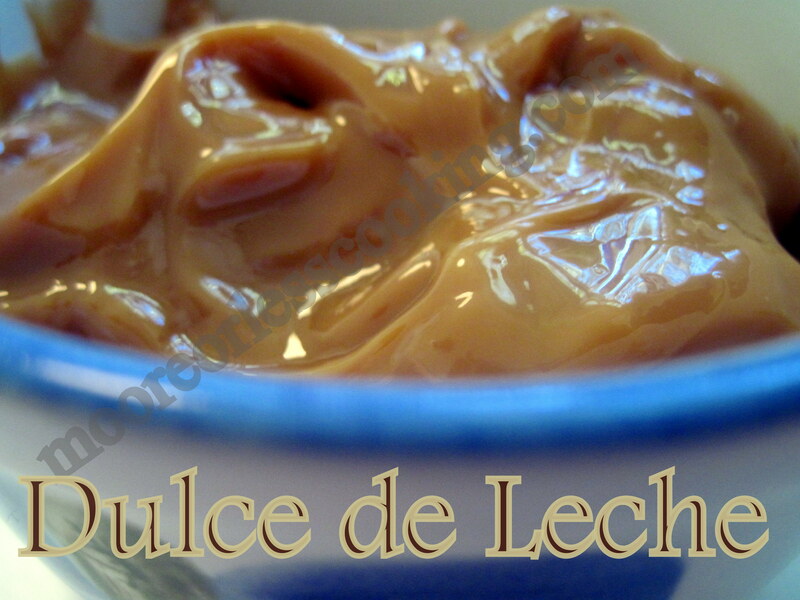 Once cooled, dulce de leche can be stored in the refrigerator for up to two weeks.